If you want to pick up a shared bike from Hillegom Station, Sassenheim Station or Haarlem Station and visit Keukenhof, just download the app for Apple or the app for Android. Rent a bike and park your car for free close to the Keukenhof! Rent a bike for € 13 till 6:00 pm. We are the cheapest. You also receive discount tickets for a meal or drink at the Mc Donalds (just a minute away) and a biking map. With the map you bike the most beautiful route through the bulb fields to the Keukenhof and back. Of course you avoid the traffic jam. To make sure you come back (on time) we ask for a deposit €20 cash per bike or your driving license. Buy (optional) a Keukenhof entrance ticket. With the entrance ticket you skip the waiting lines at the Keukenhof too. The prices are the same, so no worries. So don’t wait and reserve your bike(s) here quickly. 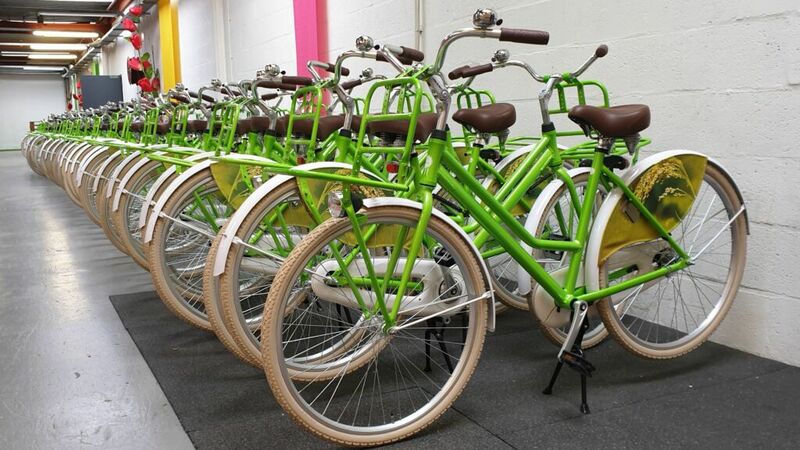 We only have 66 bikes in original Keukenhof colours. You can pick up the bikes at Fietsuniek and you can park your car there too. Our location is Arnoudstraat 10, 2182 DZ Hillegom 200m from the Mc Donalds. This service is provided by Fietsuniek and Uw Deelfiets. If you want to rent for groups (5 to 60 people), just send us an e-mail to info@uwdeelfiets.nl.